There’s two spots in my house that ALWAYS get stained and grubby: the kitchen sink and the bathtub. You see, I’m an avid tea drinker and oil painter….and I live with a contractor… and perhaps a dog too. This basically equals rings in the sink from back to back mugs of Double Earl Grey Tea and my paint brush jars as well as the grimy residue that comes from working with your hands a lot. Well, let’s just say that my boyfriend comes home looking like a dirtball most days so you can imagine how dirty the bathtub gets. And let’s not forget Dirtball Jr. my boyfriend’s partner in crime, our dog Orion. He gets a good washing about once a week which can leave all kinds of icky things lurking around. Needless to say all of this leaves the kitchen sink and the bathtub looking less than sparkly white. So, what’s a girl to do? Make her own soft scrub of course! Making your own soft scrub is quick and easy and the best part? It’s effective and chemical free! I downright refuse to use bleach laden chemical soft scrubs: one, because they’re nasty for your health. And two, they make me wheeze. It’s not very pleasant. Then, I came across something really amazing. Lemon Essential Oil (where to buy for 24% off). This stuff packs a powerful punch against stains. Not only that, it’s great for removing all kinds of gunk, even odors! Lemon has an amazing ability to lighten and brighten even the darkest stains. Mix it with a little bit of castile soap and baking soda and you’ve got yourself an amazing homemade soft scrub. • In a glass bowl , mix the baking soda and castile soap together until you make a thick paste. Adjust until it’s just right. • Next, add in the lemon essential oil and mix well. • Apply the soft soap directly to the stain and scrub with a scrubby sponge until the stain is gone. You can store this soft scrub in a mason jar like this one . [yumprint-recipe id=’41’]This recipe is probably one of my favorite all natural cleaning products. I hope you give this simple DIY soft scrub recipe a try! Do you have a favorite natural cleaning product? Please share below! 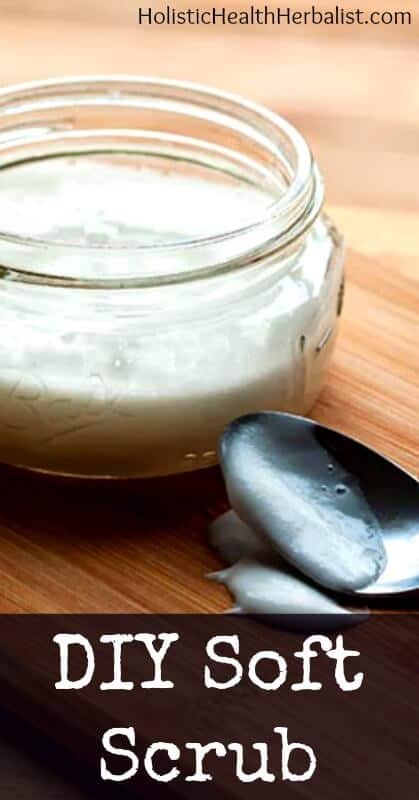 Photo Credit: http://www.isntthatsew.com/ Be sure to check out her awesome soft scrub recipe!